I work from home so it's sometimes hard for me to separate myself from work and relaxation. Work is always there lingering in the background. In order to not get distracted by it I have to be very intentional. 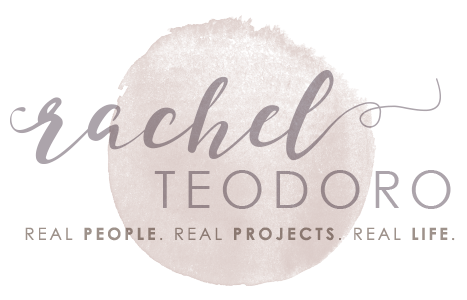 I've set up specific work hours for myself that I try to adhere to. I also try to focus my work in just one room. The other areas of my home need to feel like home, not like work so it's important to me to have things in those spaces that feel relaxing and warm. 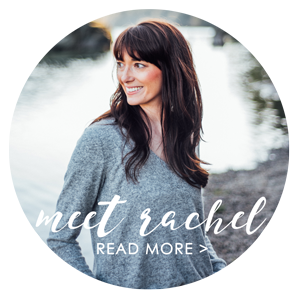 Candles are one of the best way to do that, which is why I was so excited when Chesapeake Bay Candle asked if I would partner with them to learn a little bit more about their Mind & Body Collection. One of my favorite ways to unwind is with a warm bath in our Jacuzzi tub. I light some candles, turn on some of my favorite music and settle in with a good book. 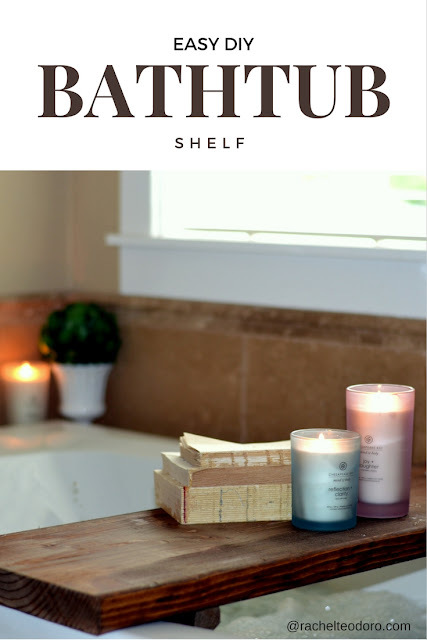 I'm sharing my easy DIY bathtub spa shelf so that you can create your own relaxing spa-like space too! Start by measuring your bathtub. I always put my head on the far end and I wanted everything I needed within arms reach. My tub is shaped a little narrower in the front and wider in the back but it's the same size along the outside. I knew that we needed the length to be 36". On our tub, it hung just over the edges. I wanted to be able to put my shelf at the narrower end without the worry of it sliding and falling into the water. This measurement is important for the two smaller 2x2 runner boards that you will be putting underneath. Use a circular saw and cut your board the length that you need to cover the span of your bathtub. Once the large board is cut, cut two smaller boards from your 2x2's. These boards will be underneath your shelf to help keep the board from sliding side to side and falling into the water. It will allow it to still go back and forth, moving it where you need it in your bathtub. You can take this time to bevel the edges and cut them on the diagonal so that your shelf looks nicer. Once your edges are cut, use a file to file down the edges and make them smooth. You could also use sandpaper. Two screws on either side hold the boards in place. Remember, make sure you have measured the inside of your tub so that your boards will fit just inside of the interior of your bathtub. Once the construction was complete, I used stain to finish the board. I used a stain that has the sealer in it to save me time and make sure my stain was sealed from water. 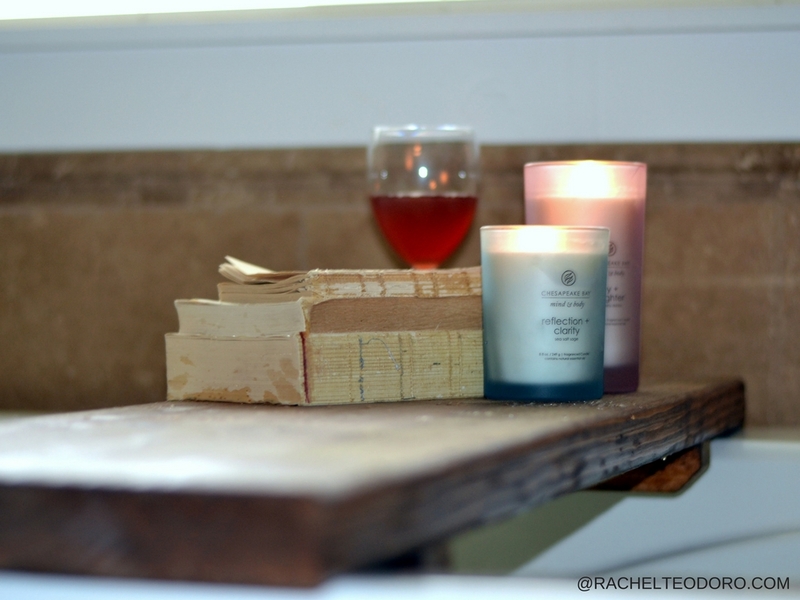 After drying overnight your DIY bathtub spa shelf is ready to use! You can never have too many candles! The Mind & Body Collection by Chesapeake Bay Candle is the perfect candle to have on hand for relaxing your mind and letting you hit the pause button on life for a bit. It's widely known that there are strong associations between emotion and scent, certain scents stimulate our brains and can affect our mood in a positive way. The Chesapeake candle does just that with hints of scents that aren't over powering but that will calm the mind and offer relaxation and clarity. I actually love the reflection + clarity candle for a soft sea salt sage scent and I love that it's in a blue jar because it reflects everything that takes me to my happy place on the beach. I burn the joy + laughter quite often because I love it's soft fruity scent and when it's lit, the glow of the pink glass is simply beautiful! When you burn candles that contain essential oils like the Chesapeake Bay candles do, you will leave your bath feeling refreshed, renewed and ready to take on the next task on your to do list because your mind will be clear, calm and ready to focus. A reed diffuser is the perfect addition to the kids bathroom. Not only does it smell good it also helps provide a calming environment for them. The bathroom is such a hub of activity for my kids. They can use all the calming soothing help they can get! I use the reflection + clarity reed diffuser set in their bathroom. It's a great way to start and end their day with quiet contemplation that the diffusers oils provide. I love that the Chesapeake Bay candles are very reasonably priced as well and all of them come with beautiful wooden lids that make them perfect for gifting. The medium candle retails at only $10 with a burn time of 24 hours, the large candle is $15 and has a burn time of 50 hours and the reed diffuser set can be purchased for $20. The bathtub spa shelf can also double as a bench if you need to sit on it. You can use it to soak your feet or shave your legs in comfort! For more information about the mind & body Collection from Chesapeake Bay Candle, be sure to visit them here. 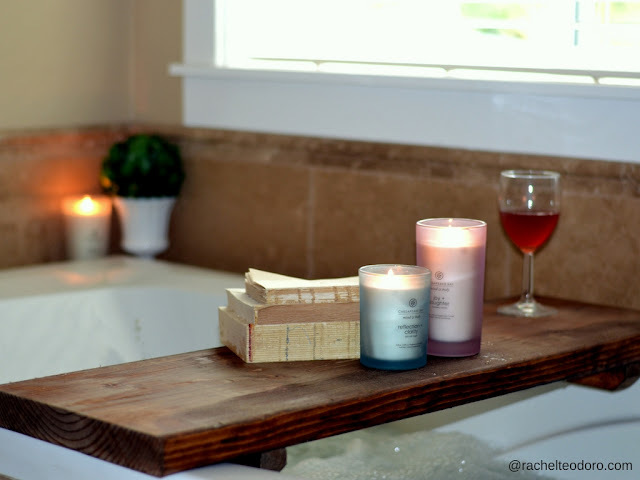 This DIY bathtub spa shelf is the perfect project to complete in under an hour. Once it's dry, you can enjoy it in your bathtub today! I think it would make the perfect gift when paired with a candle from the mind & body collection. disclaimer: this is a sponsored post for Chesapeake Bay Candle. All opinions are 100% my own. I wouldn't write about something I didn't love. Promise. This is a great idea! And it turned out beautifully! It'll look great in my bathroom too! Thanks! I think I just found a project for my hubby to make me!! Love this! Great project - looks like such a relaxing place for a bath! I love this idea! Long soaks in the tub are the best! Thanks guys! It was super easy to make and was ready in no time. It's the perfect bath time addition. I just put this on my Christmas list for my husband!